It is essential to keep your dogs and cats cool, safe and hydrated during the summer months. Cats and dogs do not sweat like humans do to keep cool during hot days, they can only pant to regulate their temperature. No water for two hours can mean a cruel death for a dog or cat. Dogs can easily tip over water bowls, so ensure that you leave out extra bowls of water during summer months. For your dogs, fill a takeaway container with bones, beef / chicken stock and water. Freeze overnight and give them to your dogs before leaving for work. Your dogs will enjoy licking the flavoured ice to keep cool. The bones are also a nice icy treat to chew on in the shade. 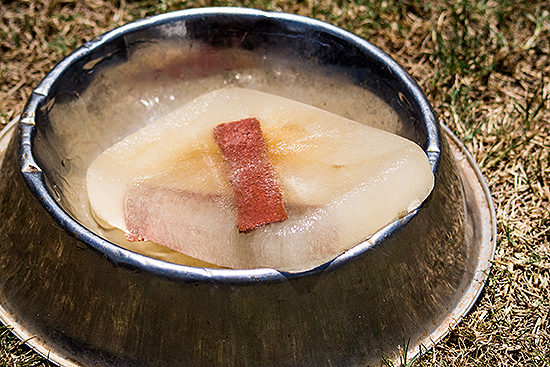 Freeze a tasty and cool canine ice block for your dog to keep cool & avoid heat stress. Purchase a Frosty Bowl Pet Water Bowl from Masters for your dog or cat. These water bowls allow you to freeze the bowl core and place inside the bowl. It keeps water cold for up to 10+ hours. The bowl also has a no-skid base and is bug and ant proof. The bowls are made from heavy gauge stainless steel so they will last for years. Frosty Bowls are available from Masters for $15. 3. Keeping cool under the shade. Provide extra shade in your backyard in the form of shade clothes or shade umbrellas. Another option is to purchase an Uptown Dog Outdoor Kennel from Masters for $299. 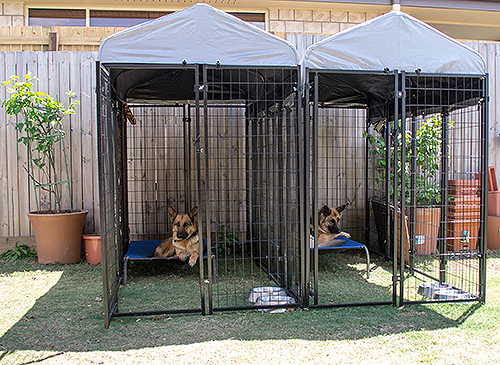 These kennels not only keep your dog safe, but provide shade with plenty of air flow throughout the kennel keeping them cool on hot days! Reduce the risk of pet heat stress with a cool, well ventilated place for dogs to rest during the day. 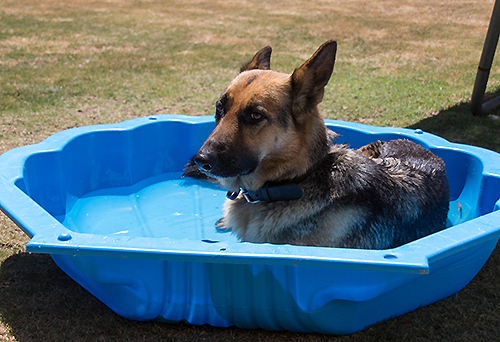 Providing a shallow pool of water assists to reduce the risk of pet heat stress. 5. Cool Pads for small dogs and cats. Cool a oven pan or ceramic tile in the fridge or freezer and put them out for small cats and dogs to lie on. Elevated pet beds are made from mesh to allow ventilation under your pet. This keeps them cool in a shaded spot. 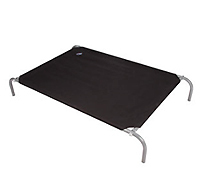 Elevated pet beds are available from most pet stores, Masters and Bunnings. Hot days are the best time to give your dog a bath. Wetting his or her fur helps to keep their body cool as they dry. Most cats hate water, however, they may allow you mist them with a fine water spray when hot. Alternatively, wet your hands with water and give them pet! 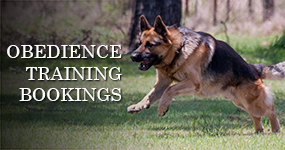 Limit the amount of exercise your dog has during the heat of the day. 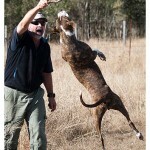 Dogs should be exercised during the morning or late afternoon. If your dog or cat has a long coat, consider trimming their coat to allow them to keep cooler in summer months. Ensure that you also groom pets with long hair to prevent mats in their coat. Pets that are most at risk from heat stress are long haired, overweight, young or older animals. Breeds that are most susceptible include Boxers, Pugs, Pekinese and Persian cats (short nosed). Bring your cat or dog indoors to share in the cooling effects of fans or air conditioning that you have in the house. Never leave your pets in a car, even on a overcast day. The temperatures in your car can heat up to lethal levels within a 5-10 minutes. Basically, if it is too hot for you, it is too hot for your pet also! 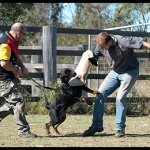 Thanks Mike & Megan, we are going off to Masters this morning to buy an Uptown Dog Outdoor Kennel. Marty was going to build a kennel to keep Mia in when we were out (she gets out when we are out and we have a storm) and to keep Abbey in when she is in heat. Saved him so much effort! You are most welcome Ruth! Teale highly recommends the Uptown Dog Kennels. Her dogs are pictured in the her kennels in the article. They are so easy to put together and quite robust. Teale also placed shade cloth on the two back panels to provide some extra shade for her two shepherds. This also helps to provide a safe area for her Shepherd who is also frightened of storms.